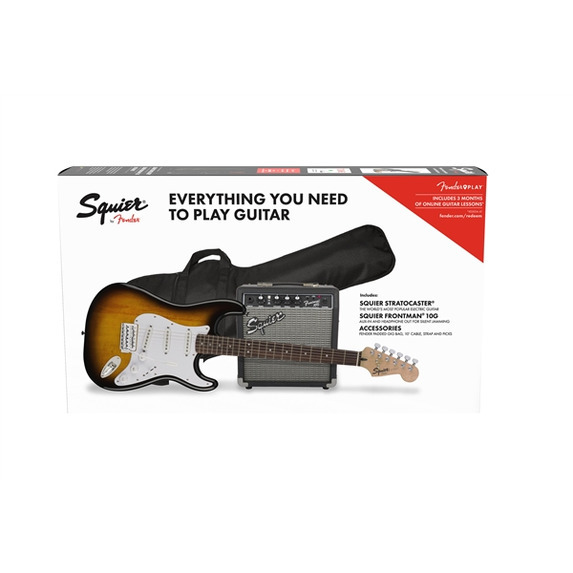 A perfect choice for beginners, the Squier Strat Pack has everything you need to begin playing right out of the box. 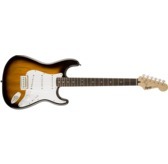 The Stratocaster is ideal for beginning players and provides a comfortable playing feel. It includes a lightweight body, a vintage-style tremolo bridge for classic pitch effects and three single-coil pickups for classic Strat tone. 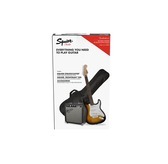 We also included a free 3-month subscription to Fender Play - the easiest way to learn guitar. The included Squier Frontman 10G amplifier is the perfect companion for jamming thanks to its aux input that allows you play along with your favourite songs or backing tracks, as well as a headphone jack for silent practice. The Squier Starter Strat Pack also comes with a padded gig bag, strap, cable and picks - everything you need to stop dreaming and start playing.